MAXSUN MS-B85-BTC bases on for Intel B85 chipset and supports for LGA1150 processors, which features multiple expansion slots to allow usage of up to 6 cards simultaneous for maximum efficiency for mining. Adopted 7 phase and all-solid capacitor ensure highly stable power delivery and great performance enchantment. Support for Intel 1150 processors and features the B85 chipset, which allows to increase bandwidth and stability. Equipped with 6 PCI-E slots which can connect up to 6 pieces graphic cards for mining, perfect for users who wish to create a dedicated mining machine. Adopted full solid capacitor and 7 phases ensure highly stable power supply. Realtek RTL8111F 1000M LAN, provides 10/100/1000Mb/s Ethernet to deliver better network responsiveness. High-speed SATA 3.0 compatible, delivering super fast 6Gbps and high speed USB 3.0 ports with theoretical transfer speed up to 5.0 Gbps. 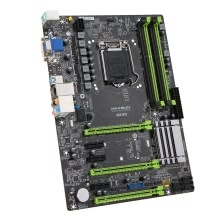 4 DIMM slots, support DDR3 dual channel 1066/1333/1600MHz memory.